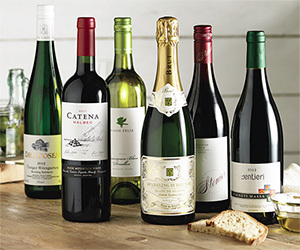 If you spent the weekend looking for inspiration for your summer menu planning, why not try the fourth recipe from Waitrose Cellar's Spring Foodie Case? 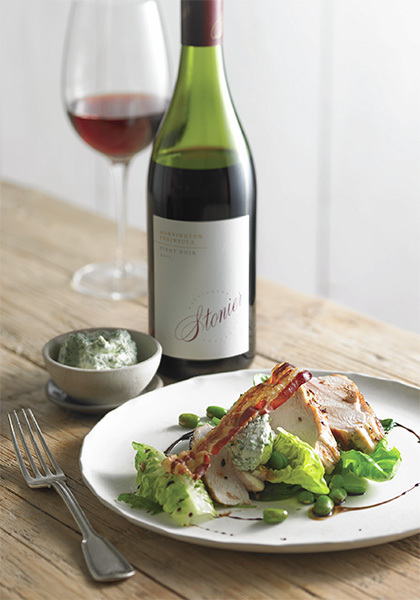 Delicious chicken breast fillets with pancetta, broad beans and herb mascarpone to pair with an Australian Pinot Noir made by Stonier. Nom nom! Order your own Spring Foodie Case now £83.94 at Waitrose Cellar which comes with all the recipes. 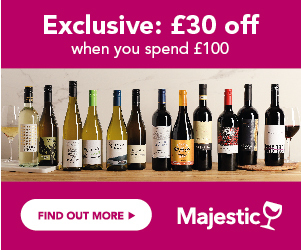 Still with free delivery and a minimum purchase of any 6 bottles. Place the balsamic vinegar in a pan with the star anise and warm slightly on a low heat. Remove from the heat and set aside. Combine all the ingredients for the marinade in a tray and add the chicken, skin-side up. Avoid covering the skin of the chicken with the marinade, as this will help the skin to go crispy. Cover the rest and place in the fridge for a minimum of 6 hours to marinate. Prepare the herb mascarpone by mixing the ingredients together with 2 tbsp cold water. Place in fridge until needed. Preheat the oven to 200°C/gas mark 6. Heat a heavy–based ovenproof pan on high heat and add a little oil. Wipe marinade off the chicken with clean dry kitchen paper and place the chicken in the pan skin-side down. Fry for 3-5 minutes, turning until well coloured on both sides. Place the pan in the oven for a further 8-10 minutes or until the chicken is cooked, and the skin is crisp and golden. Remove from the oven, pour off any excess fat then leave to rest for 5-6 minutes. Meanwhile, spread the pancetta out onto a baking tray and bake in the oven for 4-5 minutes until crisp. Remove and keep warm. Remove the chicken from the pan and place on a chopping board. Put the pan back on a low heat, add the broad beans and warm through. Add the mixed leaves and stir through. Season with a little salt and pepper and add to a bowl along with the Baby Gem and toss well. Divide the mixture evenly between 4 plates. Slice the chicken in half and place on top of the bean and leaf mixture. Spoon a little of the warm balsamic vinegar over the chicken, top with a tablespoon of the herb mascarpone and garnish with the crisp pancetta. The remaining herb mascarpone can be kept in the fridge for up to three days. It’s delicious served with baked salmon or monkfish. Pinot Noirs from Stonier are always very elegant and light with pure fruit flavours. If you want to store them, they are best consumed within five years following the vintage. This wine has vibrant raspberry, cherry and savoury plum notes which match perfectly with full flavoured - but not overpowering - foods. The creamy mascarpone and chicken are wonderful with the wine. View the Spring Foodie Case booklet containing all the recipes. The Spring Foodie Case is now just £83.94, making the price per bottle £13.99.